Jay Leno loves vintage cars. In fact he claims that buying vintage cars is cheaper than having lots of women! Back in 2005 he bought a vintage car–a 1931 Dusenberg Model J–that belonged to John Straus, the grandson of Macy’s found Isador Straus. Both Isador and his wife Ida perished when Titanic sank in 1912. Leno thought he had gotten a good deal for $180,000. The car though was not in very good shape due to water damage and neglect. But with the help of a restorer and lots of work, the car has been restored to “better than new” according to news reports. The car had been stored since 1931 in a leaky garage contributing to its poor condition. In 2005 the garage sought $22,000 in fees. The fees were apparently paid but the garage auctioned off the car anyway (whether this due to an oversight or something else the article does not make clear). What is clear is that Leno got the car and a lawsuit from the Straus family claiming the auction was a sham. The argument seems to have been Leno was in cahoots with the garage to get the car. The legal action was just settled. As is the norm in such matters, exact details are always confidential. News reports indicate that while the Straus family got money, it did not come from Leno. The car itself was never very pretty said Leno. It was built to ferry wealthy people around New York City. Leno does enjoy driving the car around reliving the days of yesteryear. Chef E. Bernard is committed to recreating that experience – without adjusting for inflation. Starting at seven bells shipboard time (7 p.m. for others), those booking passage will be greeted, given a White Star Line “Boarding Pass” and seated for an unhurried evening of sumptuous epicurean dining. Music of the day will be played on piano, violin and guitar – recreating the same make-up of musicians that played aboard the Titanic. Various special decorative touches will help complete this bygone shipboard ambience and elegant dining experience. The first menu being served includes meals served about Titanic. Subsequent weekly dinners every Thursday offer either three or five course meal that includes champagne, an unhurried pace, and pastries prepared from recipes served on Titanic. Be prepared to fork (no pun intended) over lots of buckzoids. The three course meal is $45 per person, the five course $65. Spooky Titanic: Spectral Cigar Smoke? That theory is an old one called psychometry, which believes that certain gifted people are allowed to see, hear, and even smell things from the past. It is often used to explain hauntings. In theory a gifted person would be able to see whatever event the haunting is about. What often happens is simply a case of now you see it–or not type of thing. Science thus far has not confirmed the theory has any merit. So what did the people smell at the Putnam museum? There are several possibilities. One is that they did smell something. Perhaps it was someone smoking a cigar near the building and got picked up by the outdoor air vents. Or someone might have been smoking a cigar illegally (the museum is a no-smoking zone) and its aroma was picked up and recirculated by the air conditioning system. Or it might have been something that smelled similar to cigar smoke. Another possibility is someone is playing a prank on them. Never dismiss this. It has happened before when suspected hauntings or poltergeist activity is being investigated that someone is found to be responsible for it. There is also the power of suggestion. Our minds are curious things and can be easily fooled at times. Take waking up at night where, between being fully awake and sleeping, you see strange shapes in your room. Once you are fully awake there is nothing out of the ordinary. People having day dreams can have this happen too, where they see or hear things that are not really happening. It is possible some who smelled cigar smoke were getting into the moment, so to speak, and suddenly the smell of cigar smoke was there. In this scenario the people are reacting not to any ghostly encounter but are in a suggestive state where such things are possible. 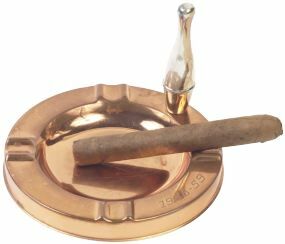 So is there a haunted cigar holder a the Putnam museum? I suspect there are more plausible explanations than a deceased Titanic passenger enjoying a cigar at the Titanic exhibit.